Tucked behind an unassuming homestead in Cutchogue, a blink-and-you’ll-miss-it Long Island farming community, Taylor Knapp tends a little greenhouse. But you won’t find exotic flowers or neat rows of herbs in this simple, 300-square-foot prefab. Inside, muggy clouds of steam periodically belch from a side room. There are just two lines of white shelves, each of which is stacked with plastic boxes containing moist earth, a few tiny wild greens, and a whole lot of snails. 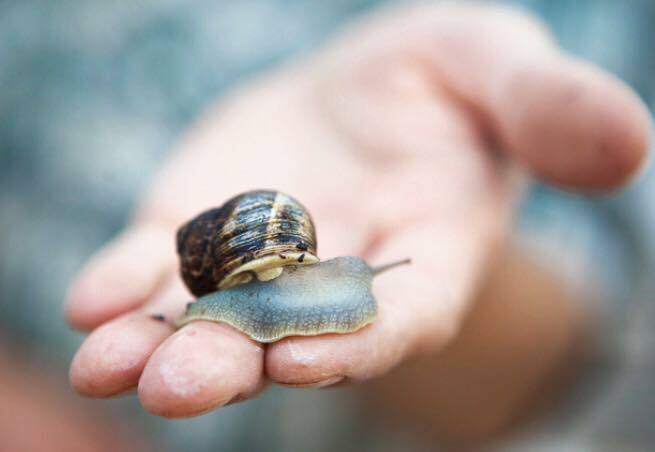 Over the past five years, Knapp and his colleagues at Peconic Escargot have joined a handful of other Americans who are trying to introduce snail farming in the U.S. In part, these intrepid farmers are giving this a shot for culinary reasons. Restaurants nationwide have long relied on imported canned varieties to fill their escargot needs. But many believe canned snails are oily and limited in flavor, while fresh snails offer connoisseurs a deeper umami kick. Containing about as much protein per pound as fish and high levels of essential minerals like iron and magnesium, snails are “a powerhouse of sustenance,” says Knapp. They can subsist on locally foraged greens, or small plants grown in their living spaces, with perhaps some cheap grains thrown in—a simple diet that actually boosts their herbaceous flavor profile. Sure, snails take longer to breed and mature than chickens; sometimes it takes them a year for them to reach maturity. But even in a tiny space, farmers can keep dozens breeding at all times. Knapp’s simple greenhouse can churn out at least 3,000 snails a week. Despite the nutritional and sustainability cases for snail farming, American producers like Knapp have grappled with stiff regulatory regimes and a dearth of information on best farming practices. And Knapp and company are still figuring out how to garner the popular interest and support necessary to make snails affordable and culturally acceptable. Well known as a staple of French cuisine, snails are still slimy and ultimately foreign to most American palates. “We’re still working to find those customers who are willing to try and eat a [fresh] snail, even if they haven’t had the canned product,” says Knapp. Humans have probably been consuming snails since prehistory. Beyond France, countries like China, Italy, and Nigeria all have vibrant snail-eating traditions. According to lore, French gold miners introduced brown snails to California in the 1850s to serve their food needs. During the French cuisine boom of the 1980s, entrepreneurial Americans started exploring the idea of creating farms to tap into escargot’s newfound profitability. Yet the escargot trend didn’t stick, and snail farming never quite gained a foothold in the U.S.
Knapp suspects this is because until a few decades ago, most countries with snail-eating traditions relied on foraging rather than farming. One of the few guides to snails available in the era, authored by a French immigrant living in California’s Sonoma County, was entirely about gathering wild snails. So it wasn’t easy to figure out farming protocols even in the ‘80s. Snails are not complex critters, but if you don’t know their ideal humidity level, pH, living density, or diet, they will not thrive. “A lot of people thought, and still think, this is a get-rich-quick scheme,” says Ric Brewer, who in 2013 founded Little Grey Farms, a snail-rearing operation on Washington’s Olympic Peninsula. “When they found out how difficult it really is” to raise or even forage snails, they mostly gave up. One of the few producers left from the ‘80s boom is Mary Stewart of California’s Central Valley, who took 15 years to hone her keen knowledge of snails, and yields a very limited supply of sought-after product. Even after the escargot boom of the 1980s faded, Americans still saw potential in snails, especially as snail experts and farmers elsewhere developed reliable rearing techniques. Helen Howard, who runs a snail farm in the United Kingdom and authored a memoir about the endeavor, Mollusks and Me, in 2013, says she’s received plenty of queries from Americans on how to get a farm going for at least a decade. But even with established protocols, would-be farmers faced another limitation: harsh regulations aimed at containing grey garden snails, a key culinary species, which is also an invasive, crop-threatening pest in the U.S. Between 2013 and 2014, though, Brewer, Knapp, and a few others doubled down on visions of snail farming, and slowly developed invasive snail-containment protocols the feds could live with. Knapp keeps pools of saltwater below the snail shelves to kill them if they should escape and slide down. The room has no gaps wide enough for a snail to slide through, and the greenhouse is surrounded by a 12-foot swathe of gravel, regularly laced with snail poison to kill unlikely runners. This latest crop of snail farmers also figured out how to adapt existing information on snail rearing to their own local conditions, adjusting snail feed, predator defenses, and containment protocols as necessary. Ever since he started selling snails last June, Knapp’s been inundated with demand, as have other American farmers, proving domestic snail rearing is viable. Operating at capacity, his greenhouse should be able to support him full-time, although he has benefitted from low-cost farmland through the Peconic Land Trust’s Farms for the Future initiative. Through a culinary incubator, Knapp also has access to an affordable industrial kitchen, where he can extract the snails from their shells and package them for consumption. Most of his customers are local chefs at restaurants, who usually feature snails in limited-run dishes. “It’s not cheap for chefs,” Knapp admits, “so a lot of the time they’re moving it on and off their menus.” Other patrons include specialty wholesale retailers and people—mainly Italian grandmas, he says—who grew up eating fresh snails and are willing to shell out for a taste of the past. “I’m working to get it cheap enough” to market it to a wider base of consumers, says Knapp. He and other farmers are constantly experimenting with new snail-rearing techniques to goose efficiency. Knapp’s also exploring smoking techniques to preserve or augment fresh snails’ flavors while rivaling canned snails’ shelf life. But the key to bringing down prices will likely be boosting demand so that farmers can buy supplies in bulk, improve profit margins, and expand operations. Brewer is convinced that snails could draw widespread interest in the U.S. He says he regularly gets calls about his snails “from people in all walks of life.” But specialty restaurant and retailer customers can only do so much for the industry. At this point in the story of domestic snail farming, it’s difficult to tell what it would take to get more Americans interested in eating the gastropods. Brewer acknowledges that snails will likely remain a niche and relatively expensive product for the foreseeable future.